The artist drew inspiration from a mid-century pattern book of floral designs for cross stitch when creating this metal tapestry with 1,225 hand-finished metal tiles. Medium: Cast aluminum tiles, bronze-coated with a patina finish. Size: 8.4-by-8.4 metres; each individual tile is 24 centimetres square. Location: Brookfield Place Calgary, 6th Avenue North Tower lobby, 225 6 Ave. S.W. Note: The Trees, a companion piece by Lexier, hangs in the James K. Gray Galleria on the south side of the building. It is based on a blown-up detail of one of the tiles of The Forest and The Trees. 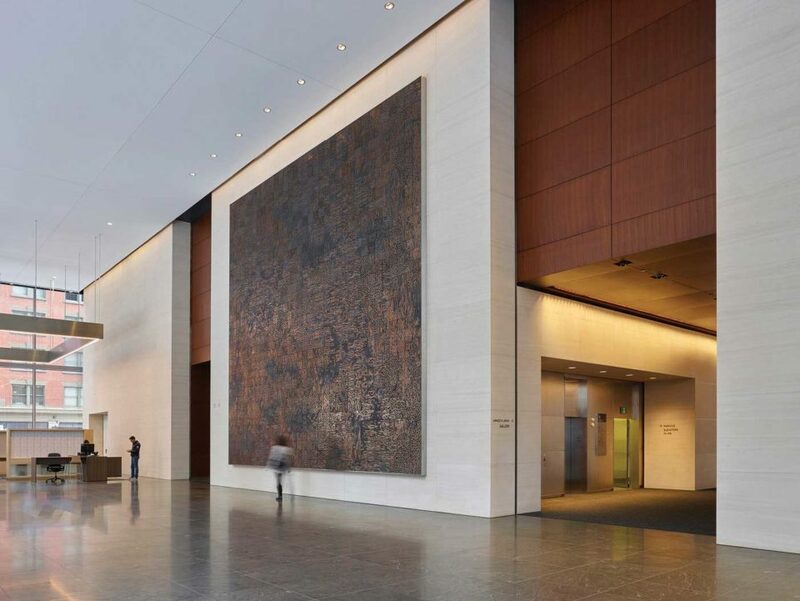 This majestic metal tapestry dominates the wide-open north tower lobby of Brookfield Place in downtown Calgary. 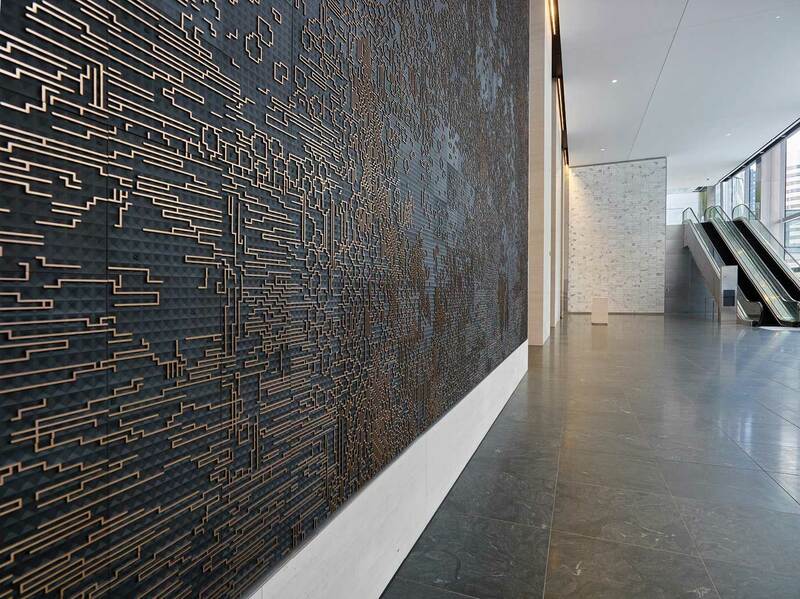 The artwork is a grid of 1,225 hand-finished metal tiles, 35 tiles wide by 35 tiles high. Each tile is 24 centimetres square, detailed with raised linear segments interspersed with numbers. As winter light transits across the surface, rich metallic hues gleam. The Forest and The Trees is a highmark in artist Micah Lexier’s long career. A recipient of the Governor General Award in Visual and Media Arts in 2015, Lexier has exhibited internationally and executed many public commissions. Born and raised in Winnipeg and educated at the Nova Scotia College of Art and Design, he now lives in Toronto. Lexier began this project with a mid-century pattern book of floral designs for cross stitch, a humble graphic beginning that presented itself as an elaborate puzzle as the artwork was developed. He organized 269 initial squares into a design of 1,225 tiles by reorienting and duplicating. Each graphic design was reformatted with a 3-D printer into a low-relief sculptural tile, cast in aluminium and coated with bronze. The Forest and The Trees is monumental. That the visual texture grew from embroidery designs depicting flora such as twin flowers and daffodils is a playful twist on the idea of landscape and a gentle reminder to those in the stunning office tower of the legacy of handcraft and the value of invention. Lexier marks human time and effort, translating those ideas into material form. In this case, his complex, unfolding process gave rise to a wall of simple beauty that exerts a solemn grandeur.